Lately I have been on a kick of combining different flavors and dishes together. 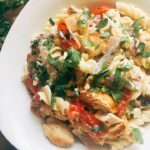 This Chicken Fajita Pasta Salad is one of my recent experiments gone well! I must admit, I was a little skeptical at first that this would work out. I am typically confident of my experiments, but I was a little worried this time. Adding pasta to the fajita mixture seemed a little…odd. So when I had the hubby try it out, I was fully expecting an “eh…” BUT he actually liked it! This pasta has a cream sauce however it is lightly dressed. For a saucier pasta, double the sauce ingredients. 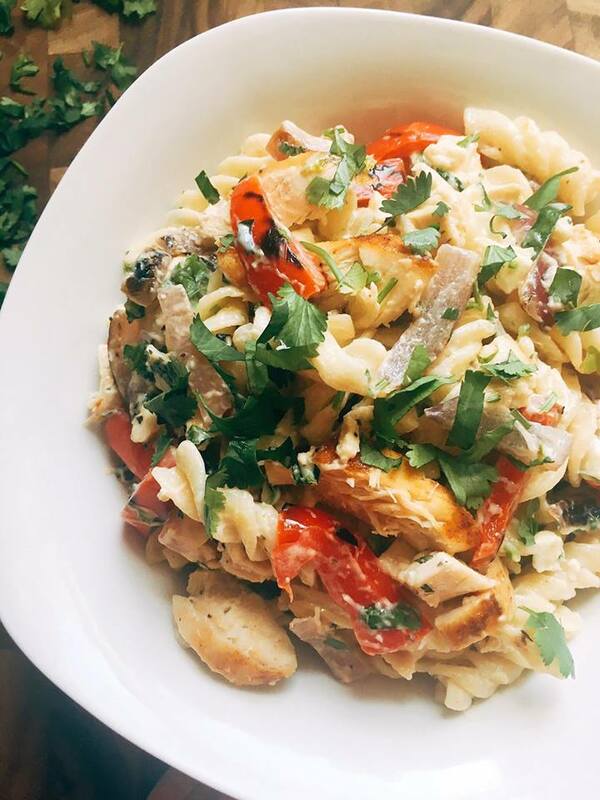 This Chicken Fajita Pasta Salad would also be great with steak or shrimp! Just use the same flavor components when cooking your protein of choice. Place chicken in a baking dish. Squeeze 1/2 of the lime over the chicken. 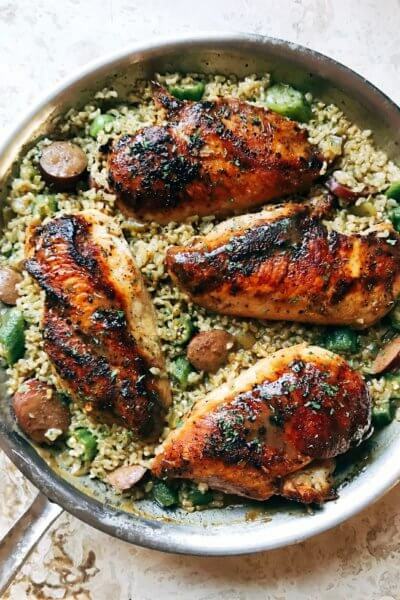 Drizzle chicken with olive oil. Sprinkle on a little salt and 1 tsp of the cumin. Bake at 350 until cooked fully through (time will depend on size and cut of chicken). Remove from oven and let cool. While the chicken is cooking, cook the pasta in salted water until al dente. Drain and place in a large tupperware. Drizzle with a little olive oil (to prevent it from sticking) and toss to coat. Place in refrigerator to cool. Also while the chicken is cooking, heat a large skillet over medium heat. Add 1/2 Tbsp olive oil to the pan. Sautee the onion and bell pepper until soft, approximately 5 minutes. Remove from heat and let cool to room temperature. In a small bowl, make the sauce. Mix together the mayonnaise, sour cream, cilantro, chili powder, the other 1/2 of the lime juiced, 1/2 tsp cumin, and a pinch of salt and pepper. Stir to combine and season to taste. Cut or shred the chicken into bite sized pieces. In the large tupperware or a large bowl, combine the chicken pieces, chilled pasta, onion and pepper mixture, and the sauce. Toss to coat. Depending on the shape of the pasta, you may need to add more sauce to get the consistency you want as shapes with more edges and holes will require more sauce. Find our Citrus Chicken Fajita recipe here! I NEED this in my mouth RIGHT NOW!!!! 😀 You should make a video about how you made this, because this would seriously become viral. This looks way amazing! Pinning it ….sounds & looks fabulous!! This looks delicious! I just bought a bunch of chicken breast today and this looks like a great summer dinner. Yum-o…this looks and sounds amazing! 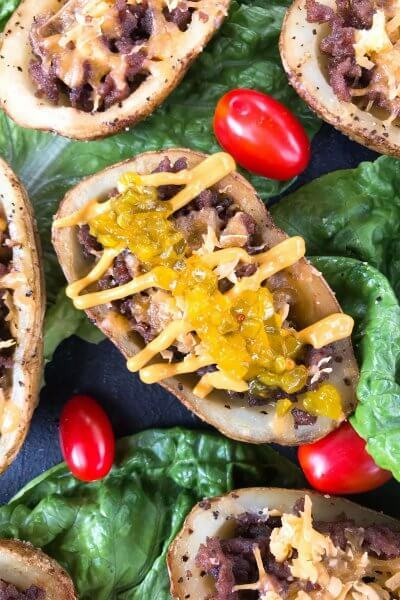 This sounds like a delicious side for any BBQ! 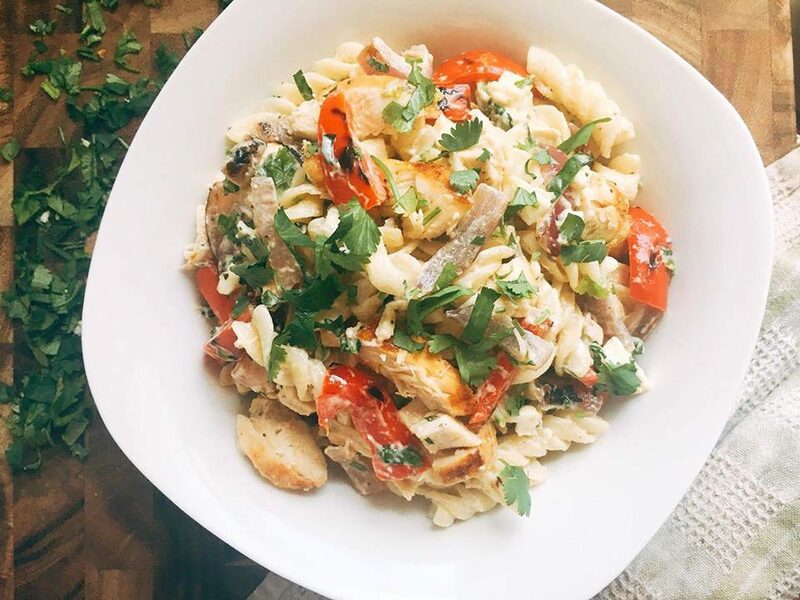 I’m a huge fan of fajitas, so I’m sure that I’ll love this pasta salad! Yum!!! This pasta salad sounds perfect for a delicious and filling lunch. Or a great side! I could go for this right now. Looks so yummy! This looks yummy. I am going to add it to my menu this week. I’ve been a big southwestern/mexican food kick the last couple of months. If this was served at a family picnic I’d probably just eat it. Looks right up my ally! Pinned! This looks amazing & I think my husband will be a HUGE fan! This seriously looks amazing. I will have to pin it to save for later. You just combined two of my favorite things – holy yum! Looks Yummy! I saved this to my Pinterest! Fajita and pasta is genius combination. Going to have try making this. This looks fantastic! I love how easy it is to make too and you could even make it with leftover roast chicken but then add the cumin etc to the mayonnaise and sour cream dressing. I’m pinning it to my things to make board and will let you know if I make it! Yes leftover chicken is perfect here! I hope you enjoy it! I love the sound of this and the simplicity of it. 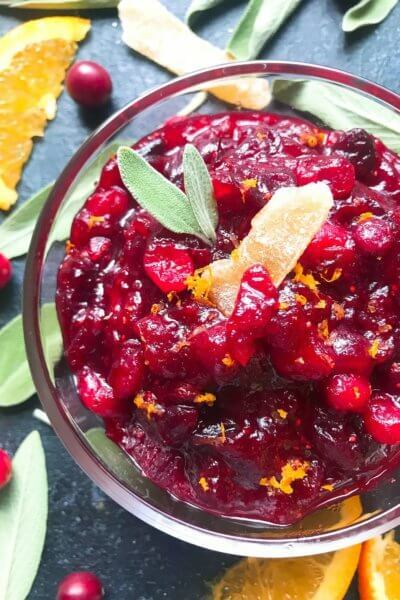 It also looks like a recipe you can add to or take away ingredients to suit individual tastes. Could this look any yummier? The sound and look of it is delish! Definitely something my fiance would love too! I love making this dish when we grill extra chicken. Work is half done. Omg this sounds so good! I love that you use sour cream as well as mayo, instead of it being straight mayonnaise. I have leftover chicken in my fridge right now – looks like I found exactly what I’m going to do with it! Trying to get my salad fix before the comfort foods come in for the season! This looks delicious. This looks delicious. I’m giving this one a try for sure. You really can’t go wrong with pasta. Going to make this for dinner tonight! This is so damn scrumptious! What a great combination and one I wouldn’t have thought of. Trying this out for sure! 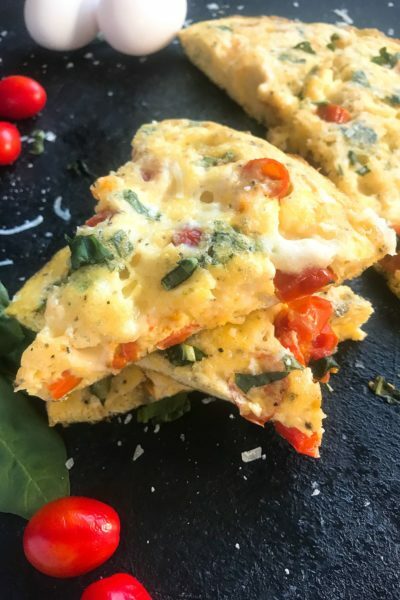 This looks so good and rather easy to make, pinned for dinner for my family thanks! This looks amazing! I think pasta is one of those dishes that you can add anything to and it will turn out great. I can’t wait to try this! Looks delicious! This might be what we are eating for dinner! I love anything with cilantro and lime – this recipe sounds so good – am pinning it to make soon! Yum! 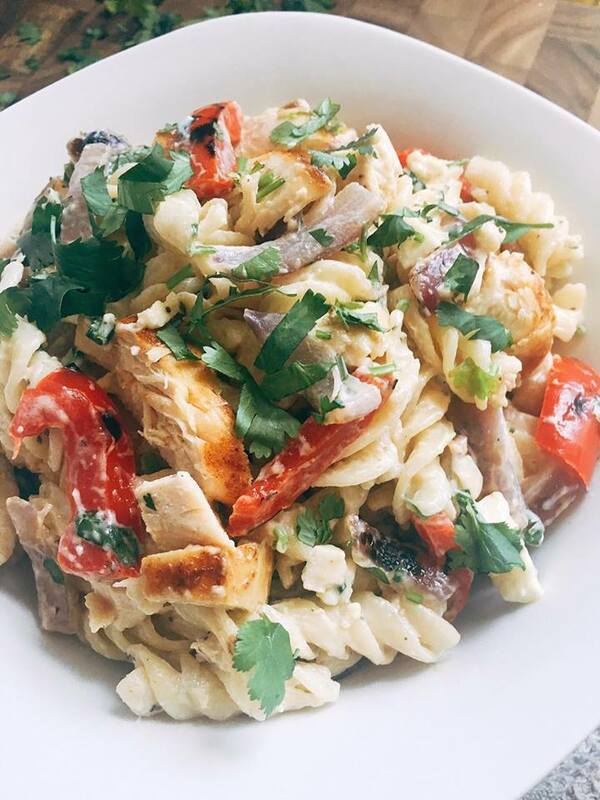 Chicken fajita salad already sounds amazing, but loving the pasta addition! This looks so fresh and yummy! Love it!